I'm loving the creativity I see when it comes to decorating sugar skulls. Some of the calaveras are just so beautiful! I can see where some might enjoy a full year of them. So I wanted to share this 2015 calendar I found on Amazon. 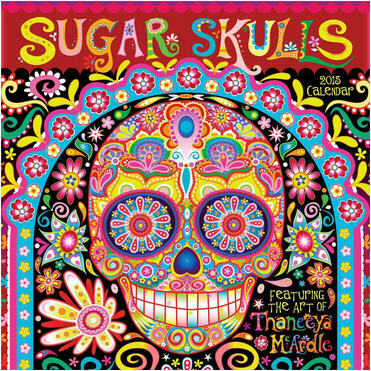 Colorful, fun, and full of psychedelic details, the Sugar Skulls 2015 Wall Calendar (aff link) features 13 of Thaneeya McArdle's intricately drawn and beautifully colored pieces of skull art inspired by Día de los Muertos (Day of the Dead). Thaneeya McArdle is an internationally collected artist who works in a variety of styles, ranging from photorealism to abstraction, to a whimsical combination of the two. This calendar would be an awesome addition to any kitchen or home office or even school room, no?